This week's Republican National Convention (RNC) has been characterized by rousing speeches from Republican leaders, critical anti-Hillary Clinton chants from impassioned audience members, and one particularly noteworthy house band. On Thursday, shortly before Donald Trump took the stage, the RNC house band played "Make America Great Again," as the large crowd jovially danced along. The single may not surge to the number one spot on iTunes, but it certainly united the GOP crowd, literally and symbolically. As Trump's campaign slogan, "Make America Great Again" as a phrase has dominated the RNC. Each night has followed a particular theme, such as Make America Safe Again or Make America First Again. The RNC house band has been there on stage throughout it all, keeping the mood light in between serious speeches and constructing a soundtrack to a historic event. It makes sense, then, that the final night of the convention heard the debut of a song that is likely — or at least should be — called "Make America Great Again." As attendees to the convention noted online, the song took after the rock genre — and it brought the crowd to its feet. 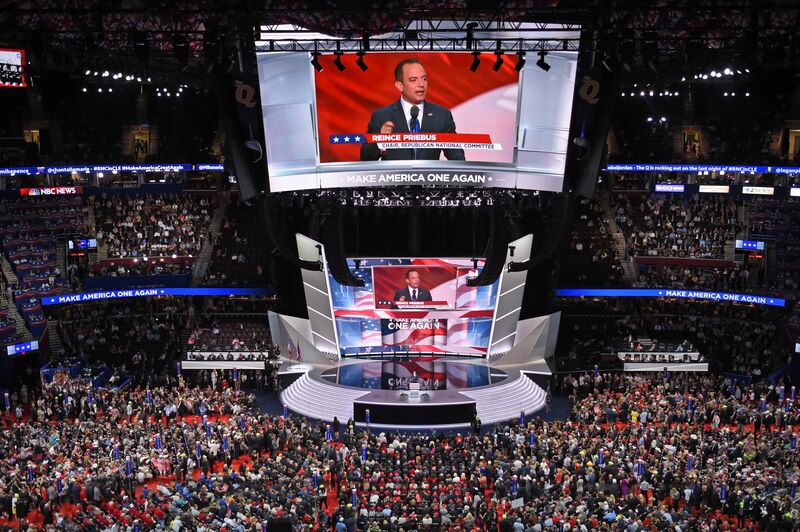 As it rang through the halls of the Quicken Loans Arena in Cleveland, Ohio, the RNC looked less like a political meeting and more like a small-time music festival. There's something to be said for a room full of Republicans dancing to a Trumpian theme song. Throughout the GOP's tough and often nasty primary race, the party became deeply divided. The "Never Trump" movement arose, the so-called insider establishment condemned Trump's outrageous statements, and rallies became violent. Ultimately, though, some umpteen candidates fell to Trump's lead, and the party has been faced with a tough reality ever since: Unite under Trump or fracture and risk giving into Clinton. Throughout the RNC, speaker after speaker (except for Ted Cruz) called for party unity under Trump. On Thursday, that unity came to life in the form of a dance party to a cheesy theme song.